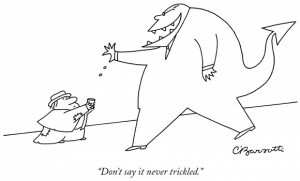 Charles Barsotti, who had drawn more than 1,300 cartoons for The New Yorker, has died. He was 80 years old. According to his daughter, Kerry Scott, Barsotti had been diagnosed with brain cancer last year, and died at home in Kansas City. Barsotti began contributing to The New Yorker in the 1960s, and was added to the magazine’s staff full-time in 1970. His cartoons became known for their simplistic approaches to complicated subjects, such as politics and religion.